The 9th Annual Scientific Meeting of the Irish Association of Physicists in Medicine was held on Saturday, 17th February 2018 in Derry/Londonderry. Many thanks to our sponsors for their generous support for this event without which it would not be possible. City Hotel, Derry / Londonderry Please contact us in advance if you require vegetarian, vegan or coeliac lunch menu options. The Conference Dinner will take place on Friday evening at 7pm in The Guildhall. There will be a drinks reception with the Mayor followed by dinner. Get Ready for a ‘LegenDerry’ Experience! Visit Derry is delighted to welcome the Irish Association of Physicists in Medicine conference to Derry~Londonderry on16th & 17th February 2018! In between your action packed conference programme, there is much to see and do and Visit Derry is here to help you plan your trip! Idyllically located in the North West of Ireland linking with the Wild Atlantic Way with the Causeway Coastal Route, the historic city of Derry~Londonderry is renowned as one of the finest Walled cities in Europe, full of fascinating history and culture. This vibrant destination offers a unique combination of rich heritage and a buzzing social scene – Derry was named as ‘Friendliest Destination in Northern Ireland’ so you will be guaranteed the warmest of welcomes! 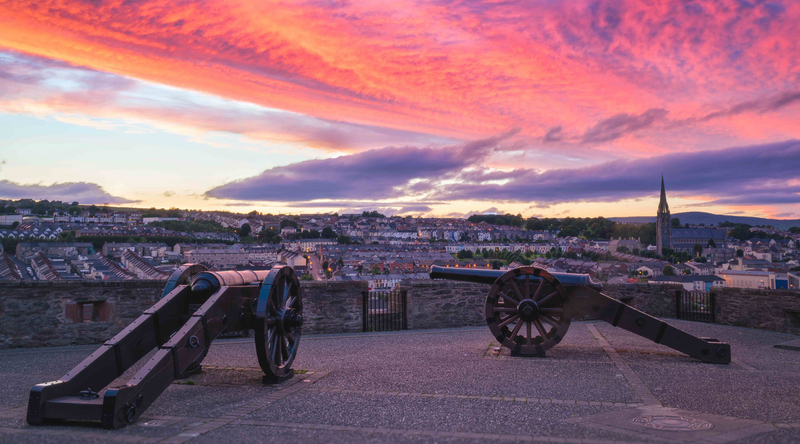 Uncover the many cultural delights on offer; take a trip back in time and discover over 400 years of history strolling along the historic 17th Century Walls, home to one of the largest collections of Cannon in Europe. Enjoy magnificent historic buildings and cathedrals or check out one of the many museums to uncover this unique destination’s fascinating story and journey to peace. If retail therapy is what you are interested in, you are spoilt for choice… This fashionista’s paradise has two shopping centres which has a vast array of high street names alongside the vibrant independent stores. For those looking for something a little bit different check out the Craft Village and ‘Above & Beyond’ at LegenDerry Warehouse, home to a range of local craft providers where you can pick up stunning pieces of artwork and clothing. A busy conference is guaranteed to work up an appetite so check out one of the many restaurants for a bite to eat. Derry was named as runner up in the prestigious ‘Restaurant Association of Ireland’s 2015 & 2016 ‘Foodie Town Awards’ so you can be sure to enjoy the very best of locally sourced produce including ‘from pier to plate’ seafood caught locally in neighboring Co. Donegal. So where to next? Discover Derry’s vibrant night time economy and see home grown artists and performers in action at one of the many cutting edge live music venues or chill out at an array of cosmopolitan cafes and bars. For anyone wishing to extend their stay, less than a 1 hour transfer takes you the UNESCO World Heritage Site the Giant’s Causeway and Bushmills Whiskey Distillery, the oldest licensed distillery in the world! To the South of the city lie the Sperrin Mountains, a stunning area of Outstanding Natural Beauty and to the West you can marvel at the magnificent natural beauty of Co. Donegal, home to fabulous attractions such Glenveagh National Park and Doagh Famine Village, not to mention some of the best links golf courses in Europe and gateway to the spectacular ‘Wild Atlantic Way’ – the longest defined coastal touring route in the world! Winner of the inaugural City of Culture 2013 and named by highly acclaimed travel publication‘Lonely Planet’ as a ‘Top 10 City in the World to Visit’ we guarantee a ‘LegenDerry’ experience!